A veteran artist who specialises in printmaking, sculpture and mixed media. 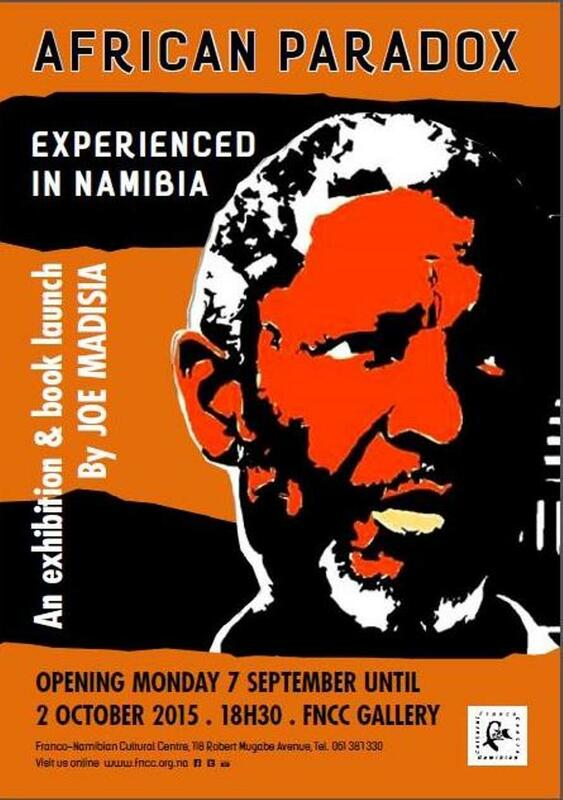 This video was produced in 2015 by Namibian Visual Artist Joe Madisia as part of his ART exhibition and book launch titled: “AFRICAN PARADOX – Experienced in Namibia” held at Franco Namibian Cultural Centre in Windhoek in September. 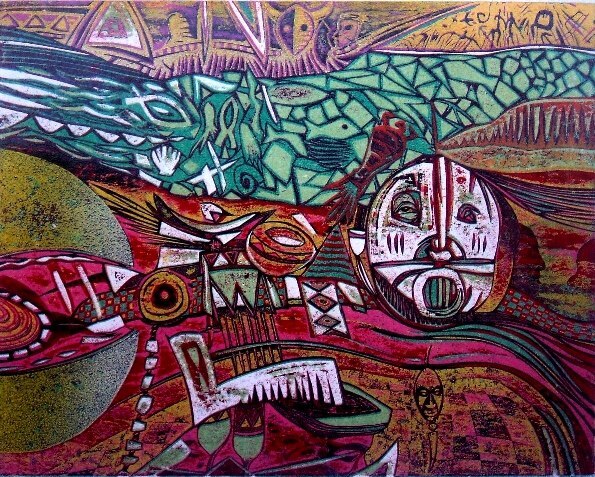 1996 -1999 BA Fine Arts, UNAM (University of Namibia) BA Fine Arts. 1983 Attend “ecc” Evening classes. 2005 Director - National Art Gallery of Namibia. 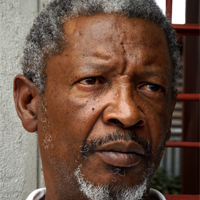 2001 Acting director - John Muafangejo Arts Centre. Katatura.Windhoek, Namibia. 2000 Lecturer - Arts Management and Development.National government. 1983 Reprographic and photographic staff - “Namib Advertising and Public Relations” advertising agency. 2001 Assisted in arranging 1st National Conference on Art and Culture Policy in Namibia. 2001 Board of Directors member. Franco Namibian Cultural Centre. 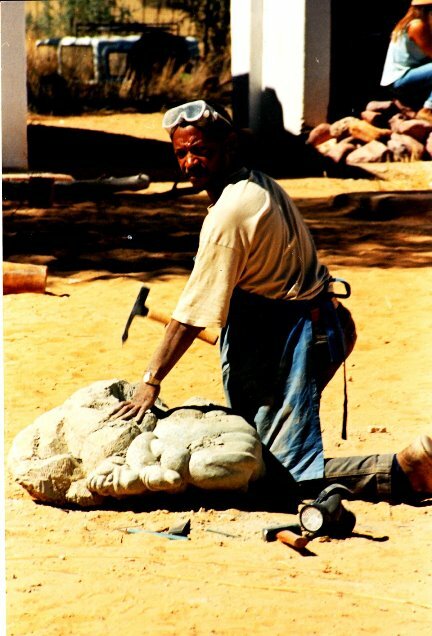 1994 Founder member of the “Tulipamwe International Artist’s Workshop”, Namibia. 1993 Member of Technical Committee - Namibian monetary currency, Bank of Namibia. 2005 Franco Namibian Cultural Centre. Windhoek, Namibia. 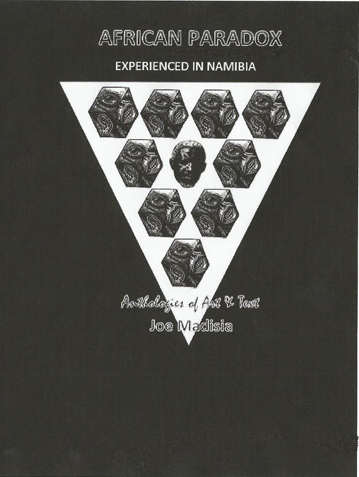 2000 National Art Gallery of Namibia – “Retrospective 1982 - 2000 ”. Windhoek, Namibia. 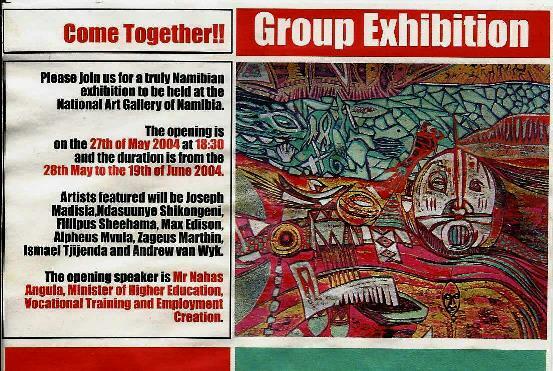 1995 National Art Gallery of Namibia – “Impressions of Walvis Bay". Windhoek, Namibia. 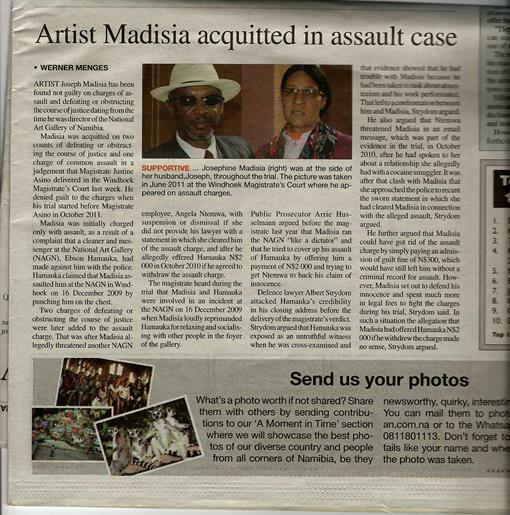 which Madisia’s lino prints was used at: Council of Churches Hall in Katutura. Windhoek , Namibia. 2009 “Sculptures in Space” at Franco Namibian Cultural Centre. Windhoek, Namibia. 2003 Group exhibition with artist: Max Katschuna, Shikongeni at NAGN. Windhoek, Namibia. 1997 “Ondambo” International Artists Conference/Workshop Exhibition at NAGN. Windhoek, Namibia. 1995 Standard Bank Namibia Bienalle. Windhoek, Namibia. 1994 Tulipamwe International Artists Workshop. National Art Gallery of Namibia. Windhoek. 1994 Koos van Ellinckhuijsen & Joe Madisia. 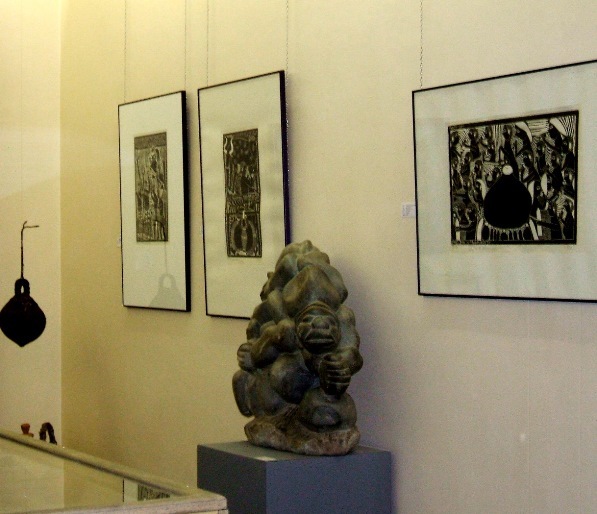 Woerman Haus Gallery. Swakopmund, Namibia. 1990 Malo Hoebel & Joe Madisia at Woermann Haus Gallery. Swakopmund, Nambia. 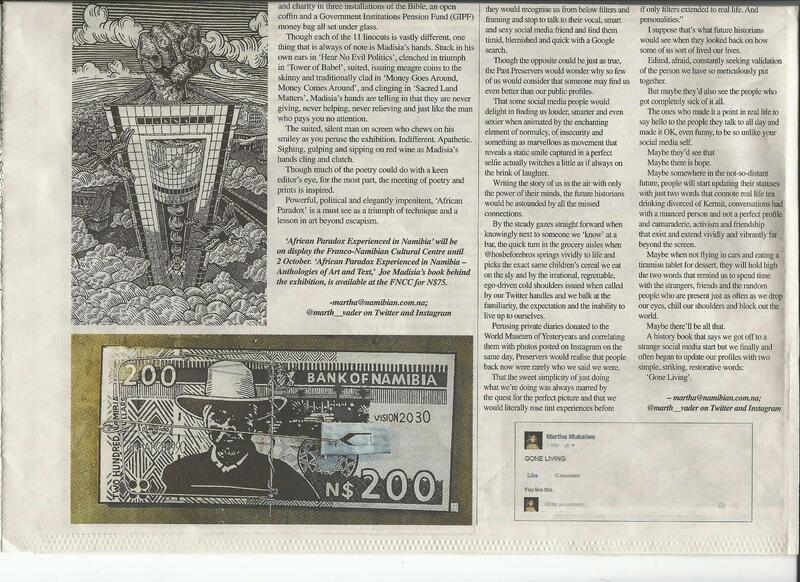 1986 “Namibia Art Today”. Arts Association of Namibia (NAGN). Windhoek, Namibia. 1985 Standard Bank Art Bienalle. Windhoek, SWA/Namibia. Gallery of Namibia (NAGN). Windhoek, Namibia. 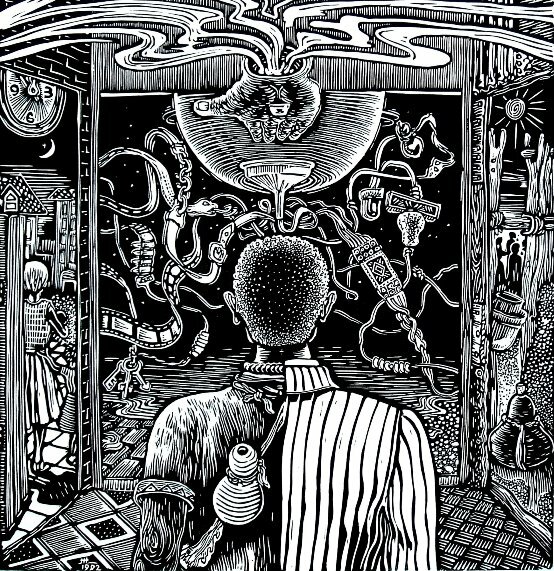 2012 “Made in Africa – Towards Cultural Liberation” at Sandton Gallery, Nelson Mandela Square on 24 May. Zimbabwe and South Africa by Namibia Artists – Alliance Française project. 2003 “Omaheke” Zeitgenossische Graphik aus Namibia – Tecklenburg, Germany. of Technology – Durban, South Africa. 1995 “11th International Print Bienalle” – Frederikstad, Norway (catalogued). 1995 “21st International Print Bienalle” – Ljubljana, Slovenia (catalogued). 1994 “22nd Sao Paolo Bienalle” – Sao Paolo, Brazil (catalogued). 1991 “Namibian Artists” at Baxter Gallery – Cape Town, South Africa. 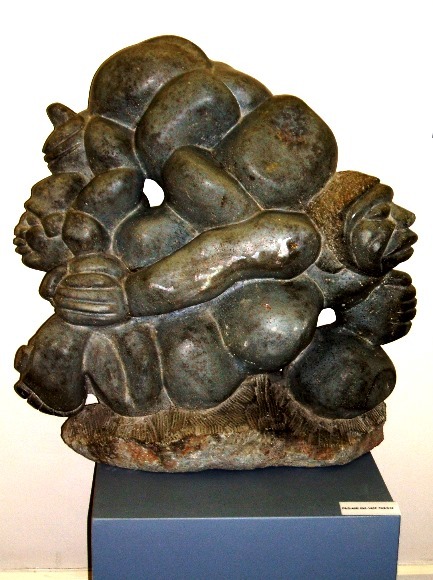 1991 “Namibian Art” at Volksbank – Trossingen, Germany. 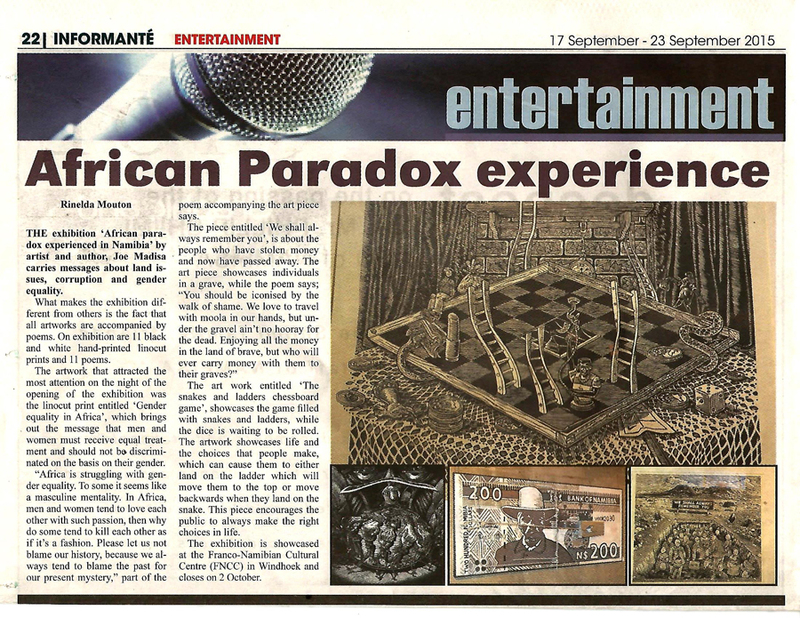 1990 SADC Visual Art Exhibition – Gaberone, Botswana. 1990 Africa Day Festival Exhibition at Pragadi Maidan Centre – New Dehli, India. Diego, Indianapolis and New York. 1993: Exchange programme and exhibition with artist: Zigi Harder, Ravensburg, Germany. 1993: Exchange Programme and exhibition with artist: Dagman Staurheim, Hågå -Aus- Torpa, Norway. 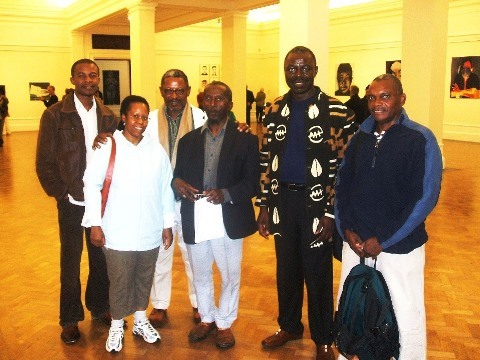 1991: Zurich and Geneva – Switzerland – Spent three weeks with Zimbabwean artists,playwrights and musicians. 1990: New Delhi – India – Spent one month with fellow Africans from the continent. 2003 “Omaheke –Getrennte Vergangenheit – Gemeinsame Zukunft – Zeitgenossische Grafik aus Namibia” Kerstin-A. Hempker – Kirchenkreise Steinfurt-Coesfeld-Borken und Tecklenburg. Martin Rehkopp – Kulturforum Rheine. Druckerei Rennemeier – Rheine. 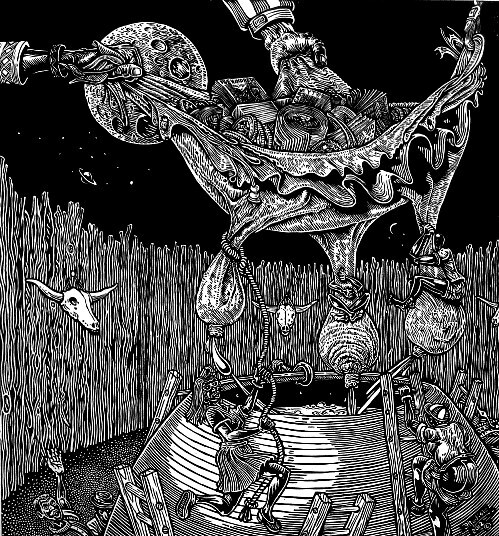 2010 “John Ndevasia Muafangejo – Etchings, woodcuts and linocuts from the Collection…” ©Arts Association Heritage Trust. ISBN 978-99945-71-11-6. 2009 “Posters in action” – “Visuality in the Making of an African Nation.” Edited by Gorgio Miescher, Lorena Rizzo and Jeremy Silvester: Basler-Afrika Bibliographien. ISBN 978-3-905758-09-2. 2004 “Insight, Namibia” November 2004. Ed: Tangeni Amupadhi and Robin Sherbourne: ISBN 1812-9943. 2000 “ Different perspectives – SADC 2000 Lecture Series”. Capital Press (PTY) Ltd. ISBN 99916-50-70-x. 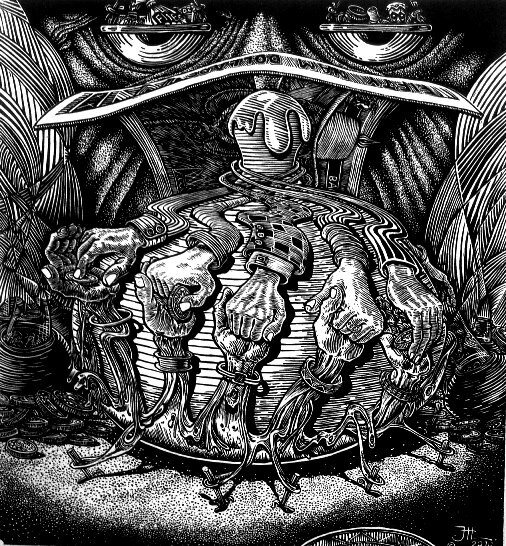 1997 “Printmaking in a transforming South Africa”. Phillipa Hobbs & Elizabeth Rankin. 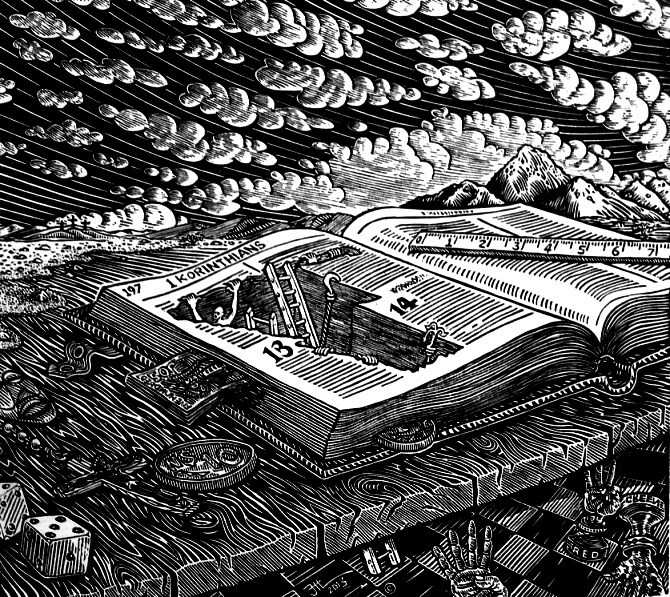 National Book Printers, Drukkery Street, Goodwood, Western Cape. ISBN 0 86486 334 9. 1997 “Art in Namibia” - National Art Gallery of Namibia. Adelheid Lilienthal. ISBN 99916 30 73 2. 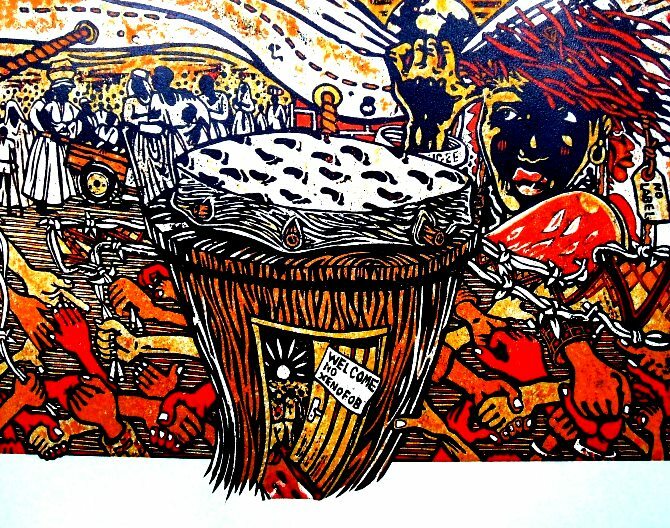 1992 Revue Noire – Art Contemporain Africain. ISSN 1157-4127. 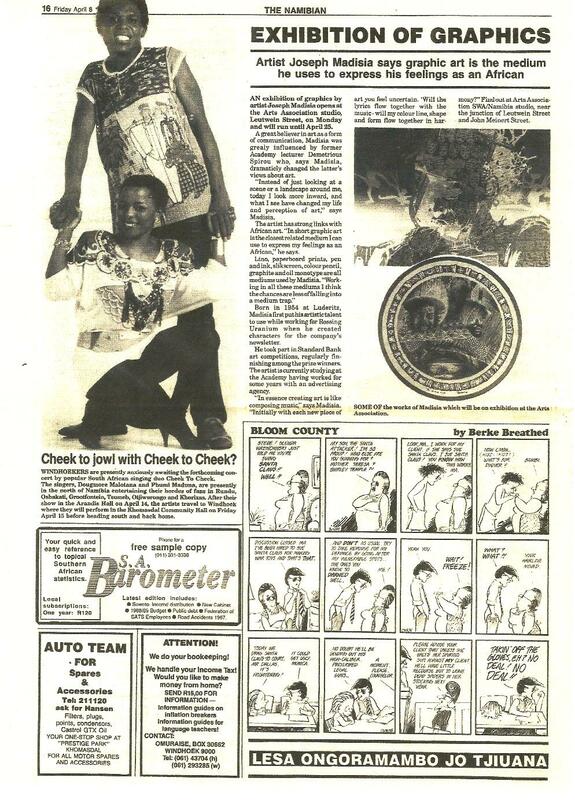 1992 The Windhoek Advertiser; Saterday - 8 August; pg.60. “Joe Madisia & Friends”. 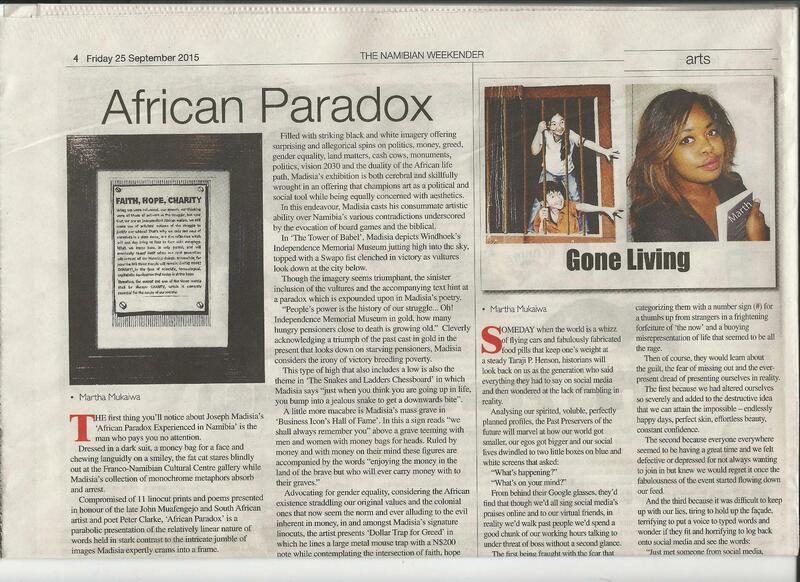 1985 The Namibian; Friday 30 August; page 27: Live Arts.- “Artist with a conscience”.